Yesterday was the final day of the Travel Goods Association annual trade show in Chicago. Thousands of dealers and media had the chance to preview this year’s new products; and some excellent luggage, accessories and gadgets will be making their way to store shelves near you very soon. Don Godshaw of Travelon won this year’s TGA Award for lifetime achievement and outstanding contributions to the industry and community. ExOfficio, manufacturer of a great line of technical clothing, was awarded the Community Service Award for their response to the Haitian crisis. Immediately after the earthquake, they went through their inventory and came up with $430,000 worth of shirts and pants to send to the victims of the earthquake. They have continued holding fundraisers and continue to send donations to the relief fund. Product Innovation Awards were presented to three companies this year. First place went to Thule for their Crossover Rolling Duffel. 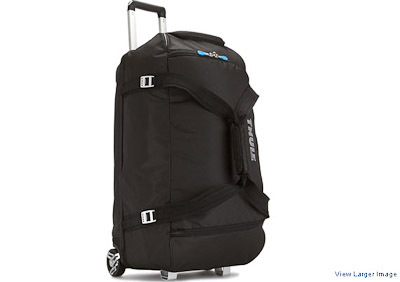 This huge, wheeled gear bag has a wide, easy access top, molded plastic back, and sturdy handle/roller combination. The special feature which everyone liked was their molded “Safe-Zone” with seperate zipper to protect sunglasses, goggles or electronics. Second place went to my favorite – Shelves-To-GO for their revolutionary packing system. A series of three shelves can be hung from your closet rod and loaded with your clothes. Then in literally five seconds, it can be removed from your closet and can be accordianned down into your suitcase. Reach your destination and the process reverses to your hotel closet rod. Be sure to see the video to completely grasp this concept. It really works. Third place went to Powerbag for their new (yet to be released) line of backpacks with built-in recharging capabilities. Their Business Class Pack comes with a 6,000mAh battery capable of recharging all your devices simultaneously – except laptop.